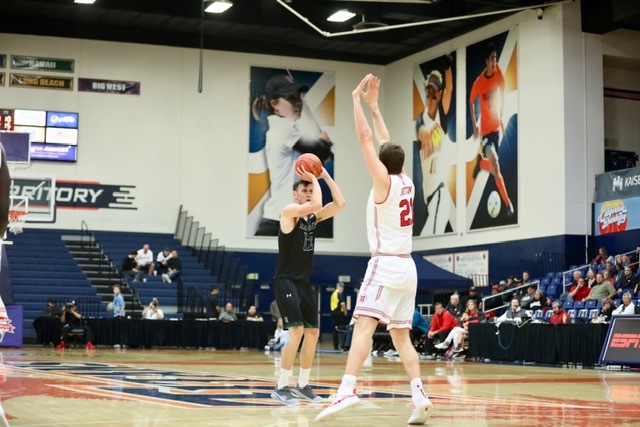 Brocke Steppeau scored a career-high 24 points — including 12 free throws in 13 attempts — and Eddie Stansberry added 15 points off the bench Thursday night to help Hawai’i stun Utah, 90-79, in the opening round of the John Wooden Legacy Classic in Fullerton, Calif.
Jack Purchase added 14 points, Sheriff Drammeh chipped in 11 points and grabbed five rebounds and Drew Buggs contributed 10 points and five assists and as the Warriors improved to 4-1 and advanced to Friday’s 6:30 p.m. (Hawaii time) feature semifinal game vs. Seton Hall. 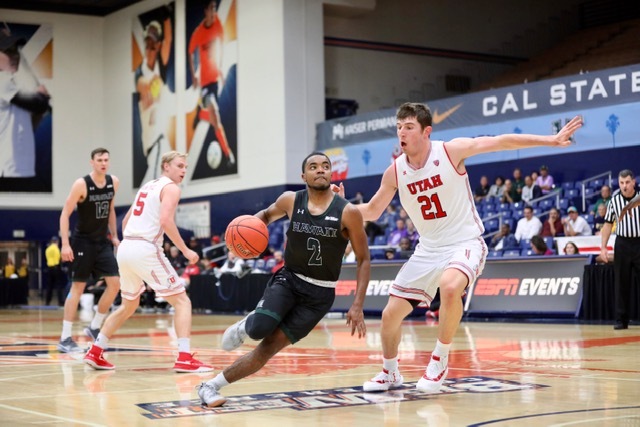 The Utes, who defeated UH in lopsided victories the past two seasons, fell to 2-2 and into Friday’s consolation bracket game against Grand Canyon. 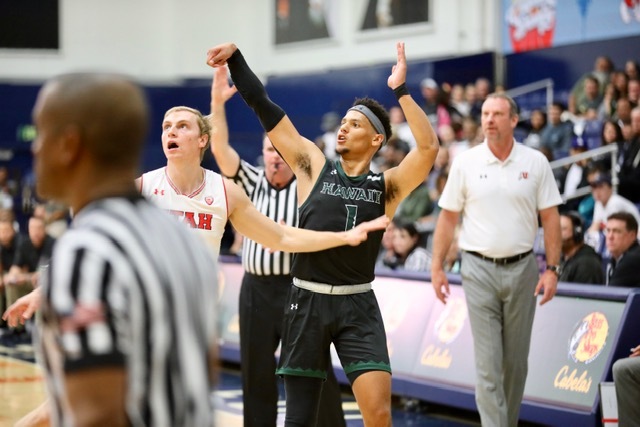 Despite having starting post Zigmars Raimo on the bench with two fouls just three minutes into the game, Hawaii hung tough with the Utes for the next 10 minutes and trailed 23-19 before Purchase started a 12-1 run with a mid-range jumper and Buggs finished it with a 3-pointer from the right corner to put the Warriors up, 31-24, with 4:11 remaining in the half. After Utah closed it to 33-28 at the two-minute mark, Stepteau converted a rare four-point play by draining a 3-pointer from the left wing and sinking the ensuing free throw to give UH a 37-28 lead 20 seconds later. Carper later closed out the half with a slam dunk to put the Warriors ahead, 39-31, heading into the locker room. Stepteau had 10 points and three assists by halftime, Buggs added eight points and four assists and Purchase contributed seven points, four rebounds and three assists. Hawaii stayed hot in the second half, using runs of 12-2 and 13-8 to extend the lead to 64-41 after Purchase’s 3-pointer from the top of the key with 9:26 left. Utah then chipped away and eventually closed it to 80-72 with 48.7 seconds remaining, but Stansberry sank two free throws four seconds later and Purchase, Stepteau and Sheriff Drammeh effectively sealed the victory with two free throws each over the next 35 seconds. The Warriors finished with 53 percent shooting from the field, including 38 percent from 3-point range. Stepteau, Buggs and Purchase combined for 15 assists and only one turnover. Miami vs. Fresno State, 9:00 a.m.
La Salle vs. Northwestern, 11:30 a.m.
Grand Canyon vs. Utah, 4:00 p.m.
Seton Hall vs. Hawai’i, 6:30 p.m.
Fifth place game, 9:00 a.m.
*Third place game, 11:00 a.m. Seventh place game, 3:00 p.m.
Good win warriors! You defend well inside to 3 pt line and bows shoot well from 3 range to FT line. UH can win away from Hawaii! Seton Hall did not see game. They good defenders..athletic..can slow down warriors. UH gets past the pirates bet they win wooden legacy championship. 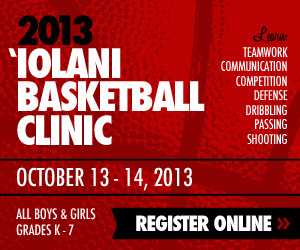 Still that little walking from Dallas Stepteau high BBIQ shoot well. Yes.last of that preferred invited walking from few years ago. Happy Brocke having good senior scholarship year! The nice preferred Walkon from Dallas brought in before eran. He really doing good. He can play somewhere after graduation I believe. I will be the first to admit how shocked I am we were able to pull out the W! Hell of a win, the first against a PAC12 squad in almost 3 years. The boys looked right at home, as just about everything went right for the team. Stansberry balled out in the second half! And I think he’s just getting started. Brock was clutch with his ball handing and free throws. The guys were hungry and caught Utah slipping! If they keep up their level of play, I feel like they have a legit shot against Seton Hall tonight! Let’s GO BOWS!! Buggs was on from beyond the arc and Stansberry caught fire in the second half. The bigs played well down low and did their job rebounding, defending the rim and hitting shots are the rim. A nice team effort and a preview of the type of team we could have. Great job Bows on national TV. Let’s run it back again tonight against SHU.